An important way in which the “Service” aspect of the Rotary Club of Greensboro is carried out is by providing financial support to carefully selected local, national and international programs and projects. Fund‐raising to provide financial support for these programs should be a by‐product of certain fellowship activities and direct solicitation of club members for voluntary contributions. The highest priority for the allocation of the Foundation’s funds will be to advance Rotary’s mission of service and to be responsive to community needs through Rotary approved projects. These are defined as projects designated by Rotary International, the Rotary Club of Greensboro Foundation Donations Committee, joint efforts with one or more local or district clubs, and local activities in which the Club or a member has a leadership role. Grants are not made to individuals. Submission of Grant Requests can be emailed to pcash@greensbororotary.org or postal mailed. Sumner Elementary School sends their thanks. 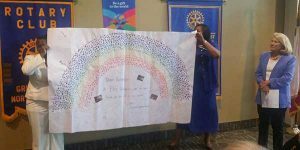 Since the formation of the Rotary Club of Greensboro Foundation, more than $1.5 million dollars has been granted primarily to local charitable and service organizations.